Unfamiliar with oysters? Just think of them as chicken livers of the sea. I grew up in Central Alabama. 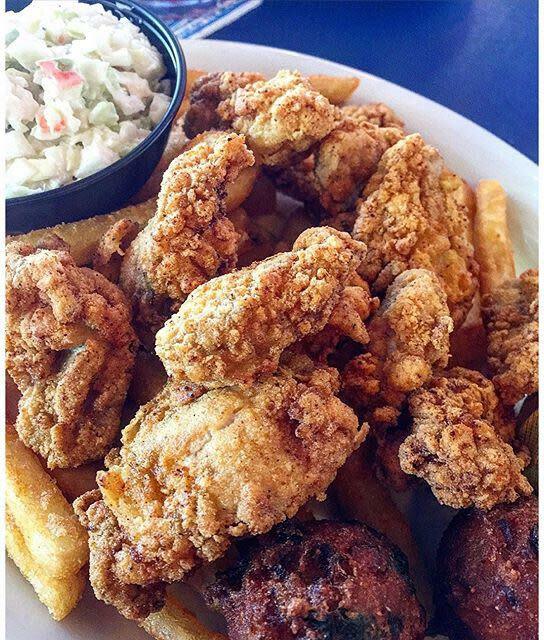 Our definition of “seafood” usually encompassed catfish, fried shrimp and, in a pinch, fish sticks. Only when I moved to Florida did I learn of the bountiful buffet the sea offers. A decade or so ago, I fell in love with Oysters Rockefeller at a restaurant in Pensacola. The oysters, which had been baked, were buttery and succulent. Topped with sautéed spinach and gooey cheese, I immediately thought of them as a decadent treat. Now I know that the sense of decadence the dish inspires is the root of its name. Oysters Rockefeller was the creation of a New Orleans chef at the turn of the 20th century who named the dish after John D. Rockefeller, the wealthiest man in America at the time. I decided to make them myself. This was my first experience preparing oysters, and while I may be a novice with this particular mollusk, I consider myself a competent home cook. Besides, even if it flopped, it would be fun. First, where to go to get fresh oysters? Luckily, Pensacola has two exceptional seafood markets. Joe Patti’s Seafood Co. is a superstore of fresh seafood. It boasts an endless counter of iced fish, crabs, shrimp and, of course, oysters – bags of the shell-on bivalves and tubs of the shucked variety up to a gallon. Joe Patti’s, located on Pensacola Bay at 524 S. B St, also offers fresh-baked bread, an extensive gourmet market and more. On my recent trip, I stopped at the stand outside for a batch of fresh beignets. 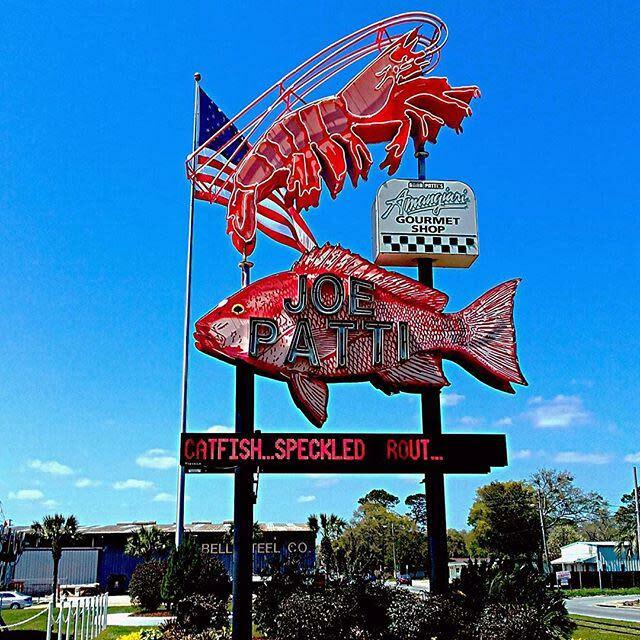 For many visitors, Joe Patti’s is as important a stop on their Pensacola vacation as logging beach hours or exploring the National Naval Aviation Museum. While a physically more modest establishment, Maria’s Fresh Seafood Market is equally ready to help – and was just as busy the day I stopped by. Maria’s, located at 621 E. Cervantes, has a sign in their shop bragging about the dozens of local restaurants that it supplies seafood for – including Flounder’s Chowder House, Hemmingway’s, Margaritaville and Jackson’s Steakhouse, along with many more. Both places had great oysters at great prices. Oysters really do remind me of chicken livers. They are similarly – shall we say – slick? They are comparable in size and texture, and shucked oysters even come in a little tub like livers do. And just like a perfectly fried liver is a beautiful thing, so is a properly prepared oyster. Melt butter in a skillet over low heat. Stir in garlic for about 1 minute. Don’t let garlic burn. Remove from heat. In a bowl, mix panko with half of garlic/butter mixture, olive oil, cheese, parsley, salt and pepper; set aside. Return remaining garlic/butter mixture to heat, add spinach and onion. Cook until wilted. Deglaze the pan with the wine; cook down. Set aside to cool. Preheat oven to 450 degrees. 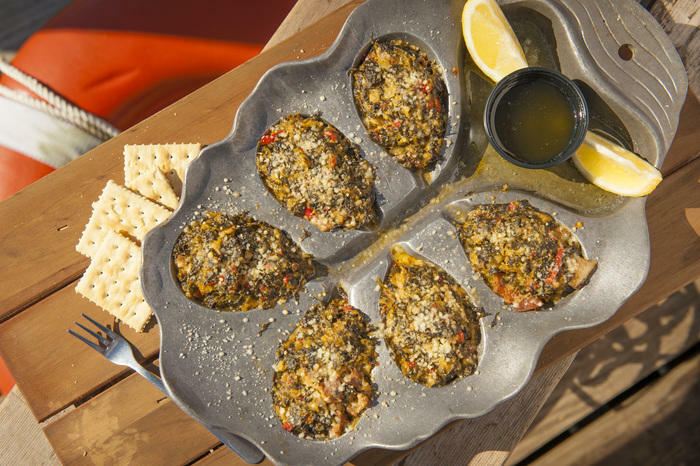 Fill cast iron skillet, casserole dish or other oven safe pan with even rock salt to serve as a base for the oysters in shells. Place oysters in pan. Spoon spinach mixture evenly over each oyster, followed by panko mixture. Set up three bowls for dredging the oyster: one bowl with flour, one bowl with eggs (beaten), and one bowl with panko and salt and pepper. Dredge each oyster, individually, through each bowl (in order), shaking at each stage to remove any excess dredge. You may want to dredge them all at once, set aside on a rack, and get them all ready to fry. Heat oil to 350 degrees in a deep fryer or to medium high heat in a heavy pot on the stovetop. Add oysters, but don’t crowd. You may need to fry in batches. Fry 2-4 minutes, until golden brown. Remove from heat and sprinkle with salt. I made both of these recipes, start to finish, in about an hour. I must say, I was very happy with the result. Again – this was the first time I’ve ever tried to cook oysters. It won’t be my last. Of course, if you’d rather leave the cooking to the professionals, the Pensacola area has innumerable seafood restaurants willing to satisfy your appetite. Fried oysters are quite common. Some restaurants known for their Oysters Rockefeller include Peg Leg Pete’s, Shux Oyster Bar, the Grand Marlin and the Frisky Dolphin. 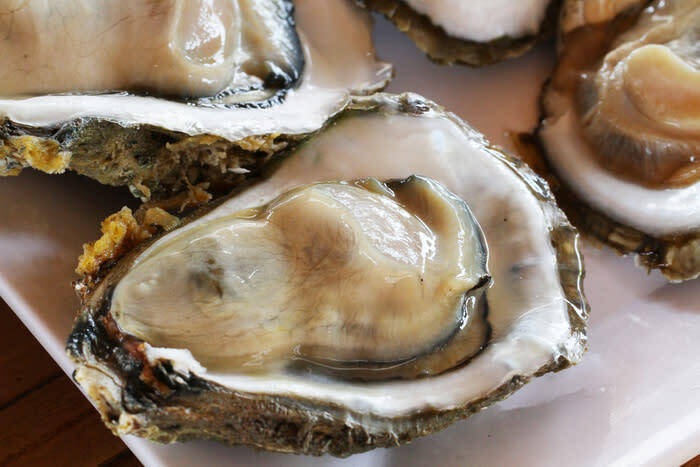 Do you have a favorite oyster recipe left off this list? Share in the comments below!